IFTN brings you a roundup of what’s in production across Ireland this summer. Check out what cast, crew and production companies are shooting on location over the coming weeks. With film and television production in Ireland at an all time high, IFTN takes a look at Ireland’s flourishing film industry to showcase some of the projects that are currently in production across the country, both north and south. The creators of RTÉ’s most successful drama ‘Love/Hate’ have come together once more to produce a new crime series ‘Taken Down’, which is currently filming in Dublin. The series was written by Jo Spain and is being directed by David Caffrey. Produced by Stuart Carolan & Suzanne McAuley, the RTÉ series stars Lynn Rafferty & Brian Gleeson. ‘Taken Down’ received €350,000 from the BAI as part of the Sound & Vision Funding Scheme. The adaptation of Irish Author Eoin Colfer’s fantasy books is being directed by Northern Irishman Kenneth Branagh, who is producing the Disney project alongside Judy Hofflund and Robert De Niro. The popular children’s novels has been adapted for screen by Conor McPherson, Michael Goldenberg and Adam Kline. Judi Dench and Josh Gad will star alongside Irish talent Laurence Kinlan and Ferdia Shaw, who plays the titular character. The feature is currently filming in Northern Ireland and will also shoot in Ho Chi Minh City and England. An action thriller following a woman’s plot for revenge, ‘The Rhythm Section’ stars Blake Lively, Jude Law and Sterling K. Brown. Filming has resumed in Dublin on the project (written by Mark Burnell) after the shoot was suspended for a while earlier in the year. The film is being directed by Reed Morano, whilst ‘James Bond’ producer Barbara Broccoli and Michael G. Wilson are producing. The hugely successful international TV Drama Vikings is currently filming in the magestical Co Wicklow location of Lough Tay. The long-running historical series is shooting its sixth series. 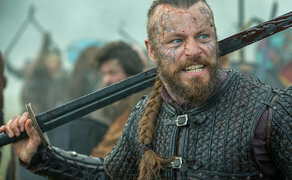 Created by Michael Hirst and produced by Morgan O’Sullivan and Liz Gill, the cast includes Jonathan Rhys Myers, Alexander Ludwig, Katheryn Winnick and Ferdia Walsh-Peelo. Mrs Wilson will star actress Ruth Wilson in a story that is inspired by the memoir of her own grandmother Alison Wilson, and her family’s complicated history. The three part drama directed by Richard Laxton, was written by Anna Symon and is filming in Northern Ireland and London. The series is produced by Amanda Black, whilst Iain Glen and Fiona Shaw star alongside Wilson in the BBC drama. Irish director Lorcan Finnegan helms this science-fiction drama starring Imogen Poots, Jesse Eisenberg and Eanna Hardwicke. The script was written by Finnegan and Garret Shanley, whilst Brendan and John McDonnell are producing. The Feature Film received €750,000 from the Irish Film Board in 2017. The psychological drama starring Adrian Dunbar follows a family in a small town in Ireland after the death of their mother. The series, written by Sophie Petzal and produced by Jonathan Fisher has begun shooting in Ireland and will be shown on TV3 in 2019. Paula Patton, Matthew Goode, Michael Caine and Bill Nighy all star in this children’s film, which has begun filming in Ireland. Written by Simon Lewis, the project is being directed by Andy De Emmony and produced by both Julie Baines and Anne Brogan. Starring Liam Neeson and Lesley Manville, this romantic drama follows a married couple in the wake of a devastating diagnosis. The film was written by Owen McCafferty and is being directed by Lisa Barros D'Sa. Additionally, ‘The Dig’ producer Brian J. Falconer is producing the project alongside David Holmes and Piers Tempest. Filming is underway in Northern Ireland. Irish projects that have recently completed filming and are now in post production are Amy Huberman’s ‘Finding Joy’, Blinder Films’ ‘Extra Ordinary’ and Element Pictures’ Rosie’.